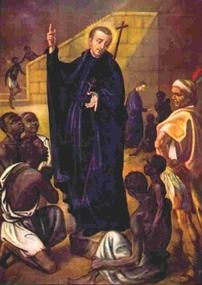 PETER CLAVER was a Spanish Jesuit. In Majorca he fell in with the holy lay-brother Alphonsus Rodriguez, who, having already learned by revelation the saintly career of Peter, became his spiritual guide, foretold to him the labors he would undergo in the Indies, and the throne he would gain in heaven. Ordained priest in New Granada, Peter was sent to Cartagena, the great slave-market of the West Indies, and there he consecrated himself by vow to the salvation of those ignorant and miserable creatures. For more than forty years he labored in this work. He called himself “the slave of the slaves.” He was their apostle, father, physician, and friend. He fed them, nursed. them with the utmost tenderness in their loathsome diseases, often applying his own lips to their hideous sores. His cloak, which was the constant covering of the naked, though soiled with their filthy ulcers, sent forth a miraculous perfume. His rest after his great labors was in nights of penance and prayer. However tired he might be, when news arrived of a fresh slave-ship, Saint Peter immediately revived, his eyes brightened, and he was at once on board amongst his dear slaves, bringing them comfort for body and soul. A false charge of reiterating Baptism for a while stopped his work. He submitted without a murmur till the calumny was refuted, and then God so blessed his toil that 40,000 Negroes were baptized before he went to his reward, in 1654.